In Chapter 13 of the Letter to the Hebrews we read about the Christian life as worship that is pleasing to God. We read about worship, praising God, and we read about service, doing good for our neighbor. We continually offer God sacrifice of praise, praising God by name. 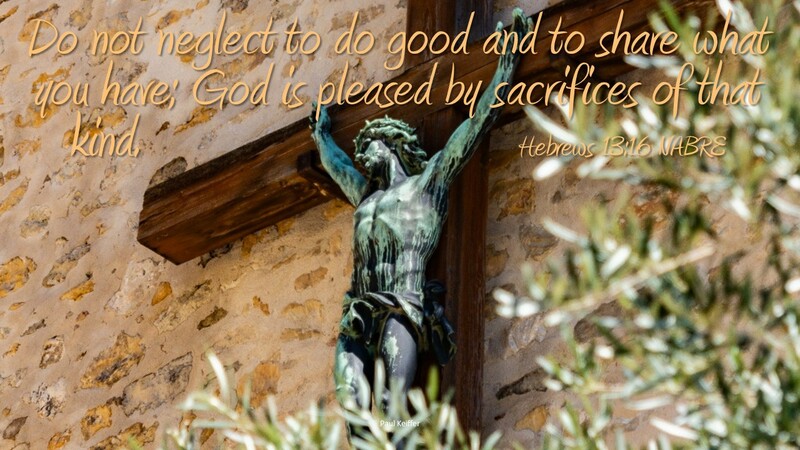 We do good and share what we have pleasing God by sacrifice. Doing good for others, helping those in need, looking out for those who are weaker and perhaps depend on others to be secure, safe and peaceful, pleases and glorifies God. It also shows our support and love. As members of the Body of Christ we serve two ways; first, we serve other members of the Body of Christ, those like us who believe but maybe need help. We refer to this kind of service as ministry, helping within the Body of Christ. Serving as ministers; we can share the message of Jesus, listen to those who may be struggling, help those who are oppressed, help those addicted or stuck in a routine that is not healthy. Ministers remind people of Jesus in their lives. The second way to serve we call missions, this is outreach to those who are not a part of the Body of Christ. Serving this group is done differently, we offer them works in Jesus name, but don’t push Jesus on them. We help with more physical things, like food, labor, contribution, accompaniment, etc. We want to live an example of Jesus so they may be interested in joining the Body of Christ but until then we help as best we can where they are. Serving others as a minster or missionary, we are like Jesus and draw nearer to Him. Serving and sacrificing for others brings us closer to God and helps us live life better. How do you serve? What reaction do you get serving?